Next postPlease Sign My Galvatron! Great ‘cast once again. I especially appreciated your insights on Superman and would heartily endorse your vision for J’Onn. 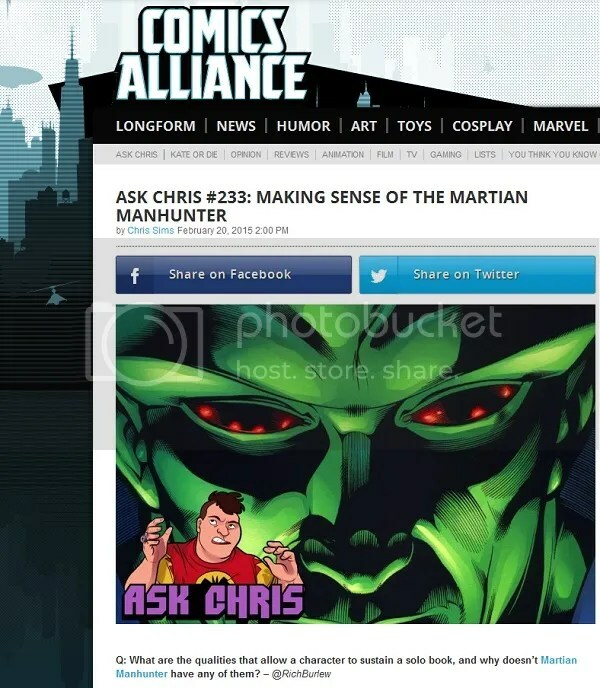 And while I hate to be that guy, one thing you didn’t touch on (and I imagine neither did Chris, I just haven’t had time to read his article yet) is the character’s look. He LOOKS like a character that should be in a team book. Quirky and interesting, but not iconic in the same way as other DC headliners. And I don’t think there’s anything you can do with the costume to fix that, it’s just that the public will never see a little (well, big) green man, especially one with inhuman features (if he were the Handsome Jolly Green Giant, maybe) as relatable as the rest of the Justice League’s solo stars. Maybe I’m wrong about that. I don’t know. But somehow I think J’Onn’s look has always kept him from being a crossover hit with readers. Nice contrast to the other heroes, but that’s as far as his superficial appeal goes. I’ll add a big “?” to all that, and let you respond.